Précis: Over the past eight weeks, some loyal readers and several friends have asked me: “Is everything okay?”; “Has my health taken a downturn?”; “Have you stopped writing your blog?”; “I have been worried about you because it has been well over six weeks since your last blog post.” I responded to each that I was well and doing fine, my health has been steady. However, the fall semester (early August-early December) for me is over-flowing with my job/work (teaching, administrative and still trying to maintain some research) and other commitments (service) [let alone trying to find time to exercise and other personal time], which leads to very little spare time to even think about composing a blog post. I apologized to everyone who contacted me; and I do stand in awe of all of the bloggers I follow who are able to both write and work full-time at the same time. Thus, the topic for the current post is about having a career/full-time job in the presence of Parkinson’s disease. There is an old saying that ‘there are people who work to live’ and that ‘there are people who live to work’: One of these phrases likely describes your attitude (or opinion) about your job/career. One phrase is not more correct than the other phrase. Likely, one phrase will matter in which career path you follow and it will contribute to your overall satisfaction in work-matters. Thus, an honest assessment will help you identify which of these beliefs you most are aligned with as your life and career unfolds. Your happiness matters. I have been in an academic medicine setting for the past 35 years and I am more closely linked with the phrase ‘live to work’. I have never regretted this career choice. It has taken me a long time to understand the how and the why of my academic career successes and advances mixed with the typical setbacks/compromises. A dear friend recently told me she could not imagine me doing anything else career-wise, it’s a perfect match. Currently, I am still able to work 6 days/week with the following goals: educating future healthcare providers, serving on several committees, and planning that next experiment to get one more research proposal submitted/funded. Then Parkinson’s happened. Health (exercise and living with Parkinson’s) + Living (importance of loved ones, family, friends, colleagues) + Career (teaching and research) = Life. The spectrum of balancing life-work ranges from happy/positive/fulfilling to unhappy/unfulfilling/find something else to do/not enough time to manage my Parkinson’s. Ultimately, at 64 years of age, and with Parkinson’s, I need to consider adding another possibility (or dimension) to my life-career equation, namely retirement. Well, at least, the thought has been planted. 7 tips and healthy habits for working with Parkinson’s: Clearly, understanding and balancing your career is an important aspect to your life (something that has not always been obvious to me). Taking care of your health and career, especially in the presence of Parkinson’s is of paramount importance and will contribute to your wellness and happiness. These are straightforward suggestions for you to consider while working with Parkinson’s; hopefully, this list will serve as a reminder about their importance. Also shown below are several photos of me at work and at play. 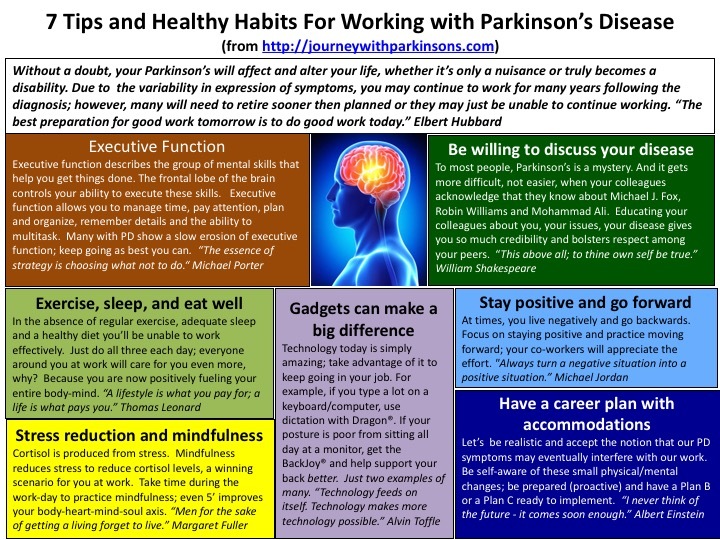 Here is a 1-page summary of the “7 Tips and Healthy Habits for Working with Parkinson’s” (Click here to download file). Executive Function. Executive function describes the group of mental skills that help you get things done. The frontal lobe of the brain controls your ability to execute these skills. There are three key features to executive function: (1) working memory allows you to keep information in your mind and use it appropriately; (2) cognitive flexibility is being able to think about something in more than one way; and (3) inhibitory control is being able to ignore something and resist temptation. Executive function allows you to manage time, pay attention, plan and organize, remember details and the ability to multitask. Many with PD show a slow erosion of executive function. You need to recognize this aspect of your mind is partly responsible for your ability to work well (or not); therefore, keep going as best you can. Be willing to discuss your disease. You have made the decision to inform others about your Parkinson’s and tell your friends and colleagues. Good for you! In my case, I spent almost a year trying to avoid telling people about my Parkinson’s. Instead I just informed people who worked with me, my family and close friends. In hindsight, living openly with Parkinson’s is so much easier because everyone has been very supportive, receptive and very caring. To most people, Parkinson’s is a mystery. And it gets more difficult, not easier, when your colleagues (family and friends) acknowledge that they know about Michael J. Fox, Robin Williams and Mohammad Ali. Educating your colleagues about you, your issues, your disease gives you so much credibility and bolsters respect among your peers. Stay positive and go forward. At times, you live negatively and go backwards. Focus on staying positive and practice moving forward; your co-workers will appreciate the effort. A constant theme of this blog has been to try to remain positive and to live in a forward manner and not look backwards. We can reflect on today and you can plan for tomorrow all you can do is relive yesterday. It’s much better to stay positive and go forward. Exercise, sleep and eat well. In the absence of regular exercise, adequate sleep and a healthy diet you’ll be unable to work effectively. Just do all three each day; everyone around you at work will care for you even more, why? Because you are now positively fueling your entire body-mind. Go here for a few additional blog posts on these topics: exercise (9 Things to Know About Exercise-induced Neuroplasticity in Human Parkinson’s; Golf And Parkinson’s: A Game For Life; Meditation, Yoga, and Exercise in Parkinson’s); sleep (Sleep Disturbances in Parkinson’s and the Eagles Best Song Lyrics; Sleep, Relaxation, And Traveling; 7 Healthy Habits For Your Brain); and nutrition (Diet and Dementia (Cognitive Decline) in the Aging; B Vitamins (Folate, B6, B12) Reduce Homocysteine Levels Produced by Carbidopa/Levodopa Therapy). Stress reduction and mindfulness. Cortisol is produced as a by-product from stress. Mindfulness reduces stress to reduce cortisol levels, a winning scenario for you at work and your brain will be healthier. Take time during the work-day to practice mindfulness; even 5’ daily improves your body-heart-mind-soul axis. Gadgets can make a big difference. Technology today is simply amazing; take advantage of it to keep going in your job. For example, if you type a lot on a keyboard/computer, use dictation with Dragon®. If your posture is poor from sitting all day at a desk, get the BackJoy® and help better support your back. I definitely have a tendency to sit too long when I’m focusing on work and writing; one way I deal with it is to have Alexa (my Amazon Echo Dot®) set a timer for every 20 minutes to get me up and stretching. I also have my Fitbit Charge 2® exercise watch set in silent alarm mode to vibrate every five and six hours, respectively, to remind me to take my medication. Just a few examples of many. Have a career plan with accommodations. Let’s be realistic and accept the notion that our PD symptoms may eventually interfere with our work. Be self-aware of these small physical/mental changes; be prepared (proactive) and have a Plan B or a Plan C ready to implement. Consider that stopping work and being diagnosed with Parkinson’s are both typically at 60 something years of age, which makes the intersection of job and PD diagnosis/progression a very important “X marks the spot”. Working while with Parkinson’s: I have had Parkinson’s for the past ~6 years, and I am still working full-time. No doubt Parkinson’s affects each person differently; it allows some to continue to work and others must stop. For the past two years, I’ve been contemplating a couple of different plans once I stop working full-time. They consist of phasing-out retirement, exercise, PD outreach, teaching, and a few other ‘opportunities’ that I’m not yet ready to describe because they are still being developed. My future will likely be as busy as I am now but not necessarily all at the same place or at the same time. When the full-time clock stops ticking it will be because either “it’s time, I’ve done enough” or my health has interfered with my schedule. My plan is still a couple of years away from being implemented. Like everyone with Parkinson’s, I’m acutely cognizant of my disorder. In the meantime, I have much left to accomplish with my education-science-service-outreach. I’m happy to see your blog post again!